Three years ago, I was awarded a scholarship and I enrolled in college. Sounds like a typical student story, right? Now, let me reword the sentence: Three years ago, I was awarded a scholarship that was made possible because of the existence of DACA. This gave me the opportunity to enroll as a first-generation college student at age 28. I was born in South America. My parents immigrated to the United States in 1999, when I was 13 years old. Trying to get away from the poverty and political conflict in our native country, we settled in the southern United States and started working towards a new life. I graduated from high school with honors, near the top of my class in 2005, but due to my undocumented status, I was not able to afford college, or even apply for it. Where I lived, I hid my status like a dark secret. I was afraid to come out to my friends. I thought they would look at me as if I was inferior or treat me differently. I was ashamed to reveal that I was undocumented and that college was not going to be my reality, even though I was an excellent student. All I wanted was to move on with my life, and pursue my goals like everyone else. My senior year of high school was tough. My friends would all talk about where they were applying to and where they were accepted, and I would lie and pretend that I was doing the same thing. I hid my status like a secret and I was never able to go a teacher or counselor to ask for help. At this time, I felt alienated, defeated and hopeless. But I stayed positive. The month after graduation I got a job and began working to help support my family, all the while thinking that something was going to work out for me to start college soon. I was restricted from getting the Pell Grant, federal student aid, private loans, and in-state tuition and my family just did not have the means to pay out of pocket. But I held on to the hope that someday I would get the chance to earn my degree. I ended up waiting close to a decade for that chance. This period of limbo was quite miserable for me. It was difficult for me to watch my friends move on and accomplish their goals, while I was stuck in the same place. I could not have much of a social life because I had no ID and limited mobility, since I was not able to drive. I felt left behind, stagnant in both my personal and professional development. In 2012, I received salvation: the announcement of DACA. I could finally get an ID and I could be legally employed. I was protected from deportation. My brother could now drive and get a job, which significantly eased the burden on my dad who had been the family chauffeur for all those years. It was a turning point for me and my family. However, I was still not able to afford college. 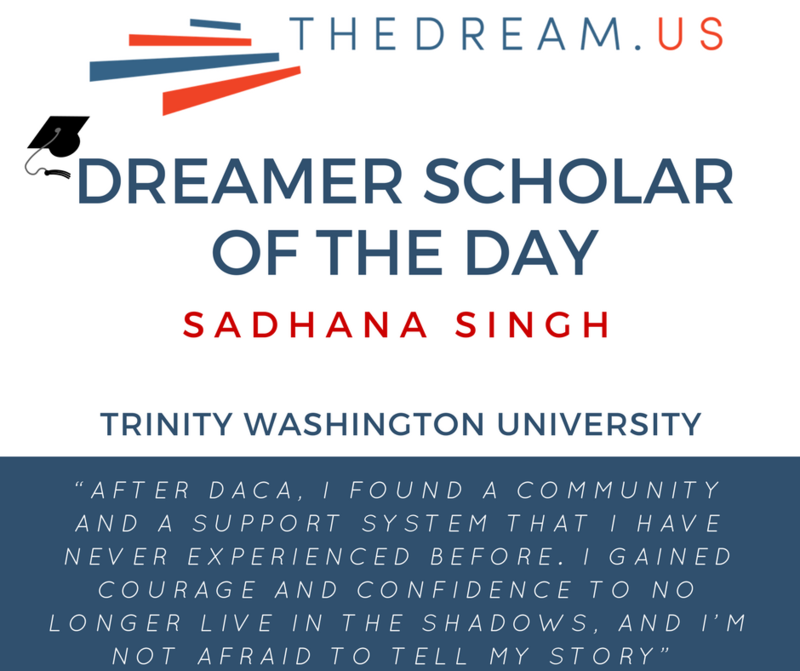 The scholarship I received in 2014 was newly created for immigrant youth who now have DACA and already possess the drive and commitment towards college, but they lacked the financial means. It fit me perfectly, and it was my ticket to a whole new life. After receiving this incredible scholarship, I was finally able to enroll in college and I became a freshman at age 28. After DACA, I found a community and a support system that I have never experienced before. I gained courage and confidence to no longer live in the shadows, and I’m not afraid to tell my story. Like the hundreds of thousands of other DACA recipients, I am incredibly grateful for the independence, mobility and peace of mind that DACA has provided for me. Every day, DACA gives me the drive and determination to go after my goals, when there were times I thought they would never be possible. I have gained empowerment and self-assurance in who I am, not only as a Dreamer, but as a woman of color as well. I am no longer ashamed of what I am labeled and I make the most of the opportunities and resources that are given to me. America has been my home for close to two decades now. I grew up in American society but could not fully take part in it. My life was on hold. Five years ago, DACA enabled me to start building my future and to fully contribute to this country. It meant the world to me to know that there are people who believed in me and wanted me to succeed. Today, I am empowered, unafraid and determined to achieve my dreams, and DACA made it possible.